The biggest promotional campaign that our industry has ever seen is just around the corner. GED – 7 June 2017 – is a chance for us all to celebrate the exhibition industry and highlight its positive impact on jobs, business, people, innovation and local investment! What happened around 8 June 2016? GED16 offered insight into the diverse and extraordinary working place that the exhibition industry is. Thousands of industry professionals joined events and activities in 60 countries. Associations, companies, universities and individual professionals alike demonstrated their support. The exhibition industry is now getting ready for GED17. With the title Think Global-Act Local, GED17 puts a special focus on the human side of exhibitions. The campaign highlights the rainbow of career opportunities that our industry has to offer by sharing the voices of the professionals that drive our industry now and in the future. We’re talking with industry professionals who have walked the exhibition floors for more than 30 years, and with the students who are yet to take their first steps in the exhibition industry. Plenty of video statements are available on the UFI YouTube channel: www.ufi.tv. Together with our GED partners, we at UFI have developed a GED toolkit with an extensive collection of material that offers easy access to everyone interested in promoting our industry! Let me know if you would like to use our facts and stats on the global exhibition industry, infographics, videos, a countdown, webbanner, social media guides and pictures. The #GED17 hashtag is already dancing through hundreds of twitter messages capturing all great moments in the run up to GED17. Make sure you sur your efforts don’t go unnoticed! The Association of German Trade Fair Industry (AUMA) plans what looks to be a fascinating forum in Berlin on “Trade Shows as Innovation Hubs – Science to Business”. Over in Hong Kong the preparations for the 1st Global Exhibitions Day Friendship Football Cup are underway. This cup aims to provide networking opportunities to participants in an informal and sporting atmosphere. As the #ufirunning club is highly appreciated by the runners joining our UFI events, I can recommend sporting networking events! These activities will surely catch the attention of people beyond our industry, and hopefully raise the curiosity of a few more young professionals. After all, we need great talents to join the exhibition industry to stay fit for the future. Every activity and event matters! 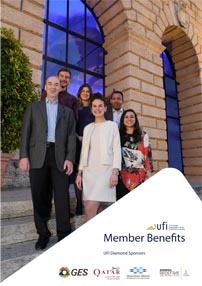 We keep an update on all activities that you share with us on our UFI website.